"WARS ARE NOT HEALTHY": Close to 100 Princeton High School students gathered on the front lawn last Wednesday to protest the policies of the Bush administration on the anniversary of the president's re-election. 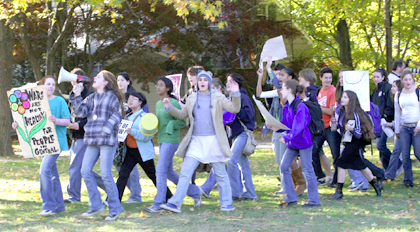 The walk-out was part of a nationwide movement organized by "World Can't Wait." Students paraded in a circle chanting expressions like "Bush Out Now." Following the hour-long protest a handful of students continued protesting by taking a train to New York City, where approximately 3,000 people gathered in Union Square. For story, see other news. Princeton Borough Democrats retained their 11-year hold on Borough government with a decisive victory Tuesday night that saw David Goldfarb win his sixth consecutive three-year-term and Mildred Trotman her eighth. The race was decidedly closer in the Township as Democrats Bernie Miller, the deputy mayor seeking his second full term on Township Committee, and newcomer Vicky Bergman, beat out first-time Republican candidates Thomas Pyle and Gordon Bryant. Princeton Borough Council President Mildred Trotman, who has presided over the municipal governing body since the death of Mayor Joseph O'Neill last month, is expected to be officially sworn in as mayor by the five other members of Council tonight at Borough Hall. If appointed to fill a one-year term, Ms. Trotman will become only the second female mayor of the Borough and the first black mayor in the town's history. The Borough's first female mayor was Barbara Sigmund, who served from 1984 until her death in 1990. Just over four months after an independent study indicated that the Princeton Township Police Department is overstaffed, the Township's administrative office acknowledged Tuesday that it intended to reduce the force by four sworn officers.